TinyCam Monitor is your mobile solution for video surveillance at home or at work. How? Keeping you connected to the remote monitoring you have installed at home or at work, using a specific IP address. The free version of tinyCam Monitor includes support for a total of 16 cameras, with only 4 simultaneous cameras at the same time, one-way audio for 30 seconds and the ability to rotate, tilt or zoom in images provided by any of the Cameras. With tinyCam Monitor you can check whenever you want the live images offered by surveillance cameras. You can also import or export the settings through DropBox or to your SD card. 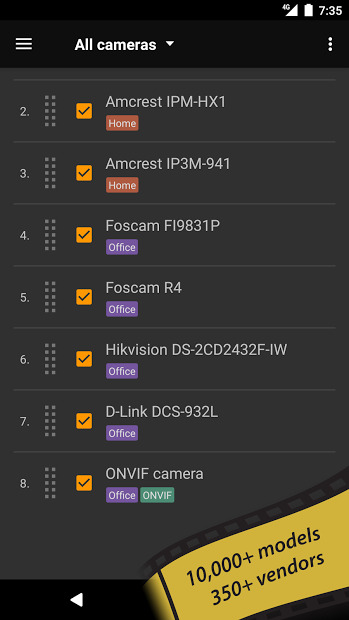 TinyCam is compatible with lots of brands of surveillance cameras. Note: This is the free version of the app with many features, but you need to get the PRO version, to unlock the Chromecast compatibility, among other options and tools.